"Great service and Warren couldn't have been nicer." 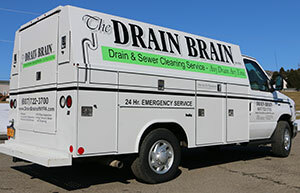 "The Drain Brain's service is very professional, courteous, and knowledgeable. It is comforting to see they care about the quality of their work and make sure everything is right before they leave, and it is guaranteed after they leave. Excellent service and very reasonable rates." "I was very lucky to call Brain Drain! Service was excellent. They arrived the same day within hours of my call. Courteous, knowledgeable, professional service. They explained everything they did to clean the main line and identified the source of the problem. Very reasonable rates & guarantee their work. I'll definitely recommend Brain Drain to family & friends!!!" "This company is excellent for drainage issues, I am so glad i picked them! -charged me $400 less than what i had paid plumber to do 6 months ago. flat rate is very reasonable. - worked around my schedule and tried to get in as early as possible -showed me via camera/video the extent of my problem in the pipe so i would have a full understanding of what needed to be done short term and long term -actually modified a piece of their equipment (on site) to adjust to breakages in the pipes and chop out the tougher roots! - very personable and dedicated to the quality of their work." "Needed to have a branch cleaned out. They were priced competitively, and were friendly on the phone. I received a call saying they were available to come early if I wanted, since I was around, he showed up 45 minutes early. He explained everything in detail, and in the process we found a clogged floor drain which he cleaned out for a very reasonable price. He was in and out in about a half hour, left the place clean, everything works great now, and guaranteed his work for 3 months. I would definitely recommend them."